Calling all budding female golfers…or even those females who have never held a golf club before but would like to see what all the fuss is about! 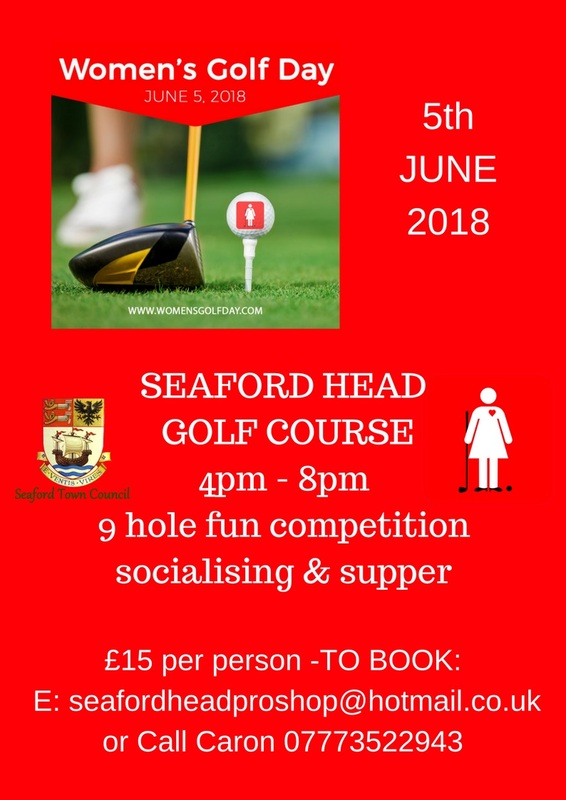 Seaford Head Golf Course is hosting a Women’s Golf Day on Tuesday 5th June, 4pm to 8pm, to try and help encourage more females into the sport of golf. Women’s Golf Day is marked worldwide, celebrating girls and women playing golf and learning skills that last a lifetime. This will be a 9-hole fun competition (around 2 hours of golf), followed by socialising and supper. Both non-golfers and those who have played before are invited along. Non-golfers will be placed with the more experienced players as mentors and provided with equipment. Players are encouraged to wear red and white if possible. Organiser and keen golfer, Caron Morton, says ‘I have been so inspired by the Women’s Golf Day initiative and as a local resident & life-long golfer, I wanted to put Seaford Head Golf Course on their global map. The Women’s Golf Day encourages all women and girls, regardless of skill level. Women and Girls, playing golf across the globe on the same day, it’s amazing. Long gone is the stereotype of golf being a male-only sport; golf is a diverse sport that is now interesting people from all walks of life, of all sexes and ages. Golf can be as physically demanding as you like; for the fitter or more physically-able amongst us, grab your golf bag and enjoy the 4 mile walk around the course. Alternatively, Seaford Head Golf course rents trolleys, to wheel rather than carry your golf bag around, or ride-on golf buggies (recommend booking in advance) to further ease the demands of Seaford Head’s gradient! Either way, you will feel exhilarated after a few hours outside in Seaford’s seaside air! Seaford Head Golf Course is renowned across the country recently being acclaimed the best course in Sussex by Sussex Golfer for its stunning views, stimulating holes and the quality of the greens and course. The View is on site as the ‘19th hole’ for food and refreshments before or after a round and is always open to the public, golfers or non-golfers. To book a place, please contact Caron Morton on 07773 522 943 or email seafordheadproshop@hotmail.co.uk . Places are £15 per person, including the 9-hole round, hire of equipment for those that need it and supper at The View.